The world record yield for paddy rice production is not held by an agricultural research station or by a large-scale farmer from the United States, but by a farmer in the state of Bihar in northern India. Sumant Kumar, who has a farm of just two hectares in Darveshpura village, holds a record yield of 22.4 tons per hectare, from a one-acre plot. This feat was achieved with what is known as the System of Rice Intensification (SRI).To put his achievement in perspective, the average paddy yield worldwide is about 4 tons per hectare. Even with the use of fertilizer, average yields are usually not more than 8 tons. Sumant Kumar’s success was not a fluke. Four of his neighbours, using SRI methods for the first time, matched or exceeded the previous world record from China — 19 tons per hectare. Moreover, they used only modest amounts of inorganic fertilizer and did not need chemical crop protection. Deriving from empirical work started in the 1960s in Madagascar by a French priest — Fr. Henri de Laulanié, S.J. — the System of Rice Intensification has shown remarkable capacity to raise smallholders’ rice productivity under a wide variety of conditions around the world. From tropical rainforest regions of Indonesia, to mountainous regions in northeastern Afghanistan, to fertile river basins in India and Pakistan and to arid conditions of Timbuktu on the edge of the Sahara Desert in Mali, SRI methods have proved adaptable to a wide range of agroecological settings. With SRI management, paddy yields are usually increased by 50–100 percent, but sometimes by more, even up to the super-yields of Sumant Kumar. Requirements for seed are greatly reduced (by 80–90 percent), as are those for irrigation water (by 25–50 percent). Little or no inorganic fertilizer is required if sufficient organic matter can be provided to the soil, and there is little (if any) need for agrochemical protection. SRI plants are also generally healthier and better able to resist such stresses as well as drought, extremes of temperature, flooding, and storm damage. The cumulative result of these practices is to induce the growth of more productive and healthier plants (phenotypes) from any genetic variety (genotype). 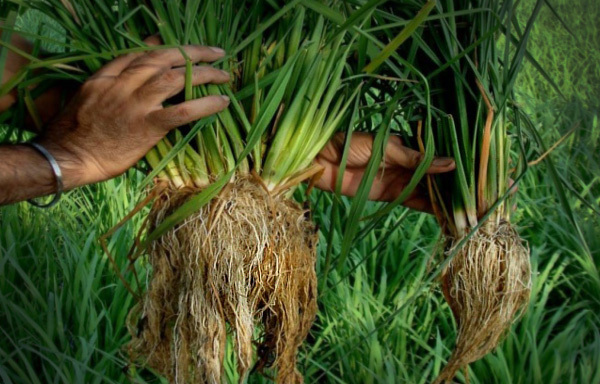 SRI methods frequently result in dramatically improved plant and root growth (SRI rice, left — conventional rice, right). Photo: Amrik Singh. Using SRI methods, smallholding farmers in many countries are starting to get higher yields and greater productivity from their land, labour, seeds, water and capital, with their crops showing more resilience to the hazards of climate change. These productivity gains have been achieved simply by changing the ways that farmers manage their plants, soil, water and nutrients. These altered management practices have induced more productive, resilient phenotypes from existing rice plant genotypes in over 50 countries. The reasons for this improvement are not all known, but there is growing literature that helps account for the improvements observed in yield and health for rice crops using SRI. The ideas and practices that constitute SRI are now being adapted to improve the productivity of a wide variety of other crops. Producing more output with fewer external inputs may sound improbable, but it derives from a shift in emphasis from improving plant genetic potential via plant breeding, to providing optimal environments for crop growth. The adaptation of SRI experience and principles to other crops is being referred to generically as the System of Crop Intensification (SCI), encompassing variants for wheat (SWI), maize (SMI), finger millet (SFMI), sugarcane (SSI), mustard (another SMI), tef (STI), legumes such as pigeon peas, lentils and soya beans, and vegetables such as tomatoes, chillies and eggplant. The evidence reported below has drawn heavily, with permission, from a report prepared by Dr. Norman Uphoff on the extension of SRI to other crops (Uphoff 2012), which accompanied his presentation on ‘The System of Rice Intensification (SRI) and Beyond: Coping with Climate Change,’ at the World Bank, Washington, DC, on 10 October 2012. Much more research and evaluation needs to be done on this progression to satisfy both scientists and practitioners. But this report gives an idea of what kinds of advances in agricultural knowledge and practice are emerging. It is not a research report. The comparisons reported are not experiment station data but rather results that have come from farmers’ fields in Asia and Africa. The measurements of yields reported here probably have some margin of error. But the differences seen are so large and are so often repeated that they are certainly significant agronomically. The extension of SRI practices to wheat, the next most important cereal crop after rice, was fairly quickly seized upon by farmers and researchers in India, Ethiopia, Mali and Nepal. SWI was first tested in 2008 by the People’s Science Institute (PSI) which works with farmers in Himachal Pradesh and Uttarakhand states. Yield estimates showed a 91 percent increase for non-irrigated SWI plots over usual methods in rainfed areas, and an 82 percent increase for irrigated SWI. This has encouraged an expansion of SWI in these two states. 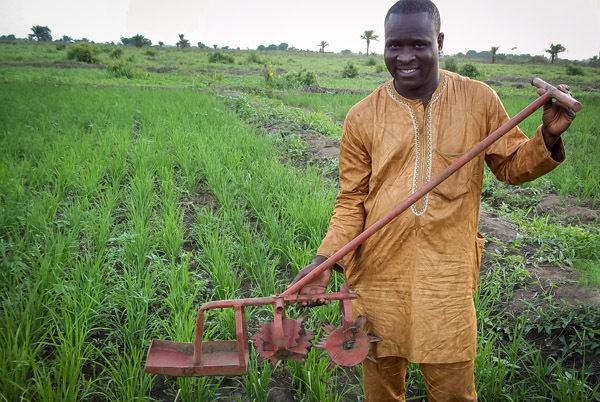 SRI farmers regularly use, modify and devise a variety of simple equipment — such as the weeder pictured here — often made locally using inexpensive, widely-available materials. Photo: SRI-Rice/Pascal Gbenou. The most rapid growth and most dramatic results have been in Bihar state of India, where 415 farmers in Gaya district, mostly women, tried SWI methods in 2008–09, with yields averaging 3.6 tons/hectare (ha), compared with 1.6 tons/ha using usual practices. The next year, 15,808 farmers used SWI with average yields of 4.6 tons/ha. In the past year — 2011–12 — the SWI area in Bihar was reported to be 183,063 hectares, with average yields of 5.1 tons/ha. With SWI management, net income per acre was calculated by the NGO PRADAN to rise from Rs. 6,984 to Rs. 17,581, with costs reduced while yields increased. About the same time, farmers in northern Ethiopia started on-farm trials of SWI, assisted by the Institute for Sustainable Development (ISD), supported by a grant from Oxfam America. Seven farmers in 2009 averaged 5.45 tons/ha with SWI methods, the highest reaching 10 tons/ha. There was a larger set of on-farm trials in South Wollo in 2010 where SWI yields averaged 4.7 tons/ha with compost. The control plots averaged wheat yields of 1.8 tons/ha. Farmers in Bihar state of India have recently begun adapting SRI methods for growing mustard (also know as rapeseed or canola). In 2010–11, 283 women farmers who used SMI methods averaged 3.25 tons/ha. In 2011–12, 1,636 farmers averaged yields of 3.5 tons/ha. Those who used all of the practices as recommended averaged 4 tons/ha, and one reached a yield of 4.92 tons/ha as measured by government technicians. With SMI, farmers’ costs of production were reduced by about half, so it gave more income as well as higher yield. Shortly after they began using SRI methods in 2004, farmers in Andhra Pradesh, India also began adapting these ideas and practices to their sugarcane production. Some farmers got as much as three times more yield while cutting their planting materials by 80-90 percent. By 2009, there had been enough testing, demonstration and modification of these initial practices that the joint Dialogue Project on Food, Water and Environment of the World Wide Fund for Nature and the International Crop Research Institute for the Semi-Arid Tropics in Hyderabad launched a ‘sustainable sugarcane initiative’ (SSI). The director of the Dialogue Project, Dr. Biksham Gujja, together with other SRI and SSI colleagues, established a pro bono company AgSRIin 2010 to disseminate knowledge and practice of these ecologically-friendly innovations among farmers in India and beyond. SSI trials are currently underway in Cuba with initially good results. The NGO Green Foundation in Bangalore in the early ’00s learned that farmers in Haveri district of Karnataka state had devised a system for growing that they call Guli Vidhana (square planting). In contrast with conventional methods, which yield around 1.25 to 2 tons/ha, with up to 3.25 tons using fertilizer inputs, Guli Vidhana methods yield 4.5 to 5 tons/ha, with a maximum yield so far of 6.25 tons. In Jharkhand state of India in 2005, farmers working with the NGO PRADAN began experimenting with SRI methods for their rainfed finger millet. Usual yields there were 750 kg to 1 ton/ha with traditional broadcasting practices. Yields with transplanted SFMI have averaged 3-4 tons/ha. Costs of production per kg of grain are reduced by 60 percent with SFMI management, from Rs. 34.00 to Rs. 13.50. Tef grown with the System of Tef Intensification (STI) in Tigray, Ethiopia. Photo: SRI-Rice/Tareke Berhe. Adaptations of SRI in Ethiopia started in 2008–09 under the direction of Dr. Tareke Berhe. Typical yields for tef grown with traditional practices based on broadcasting are about 1 ton/ha. But Berhe found that transplanting young seedlings at 20×20 cm spacing gave yields of 3 to 5 tons/ha. With small amendments of micronutrients these yields could be almost doubled again. In 2010, with a grant from Oxfam America, Dr. Berhe conducted trials and demonstrations at major centres for agricultural research in Ethiopia. Their good results gained acceptance for the new practices. This year, 7,000 farmers are using STI methods in an expanded trial, while another 120,000 farmers are using less ‘intensified’ methods based on direct-seeding with the same SRI principles. That SRI principles and methods could be extended from rice to other monocotyledonous plants was not so surprising. That mustard would respond very well to SRI management practices was unexpected, because it is a dicotyledon. It is now being found that a number of leguminous crops can benefit from practices inspired by SRI experience. A summary of these successes is found in Uphoff (2012). Also in the same brochure are farmer-led successes in adapting SRI methods to vegetables. 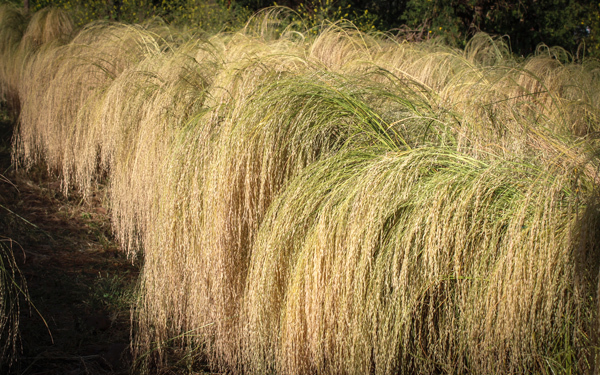 Philosophically, SRI can be understood as an integrated system of plant-centered agriculture. Each of the component activities of SRI has the goal of maximally providing whatever a plant is likely to need in terms of space, light, air, water, and nutrients. SRI thus presents us with the question: if one can provide, in every way, the best possible environment for plants to grow, what benefits and synergisms will we see? 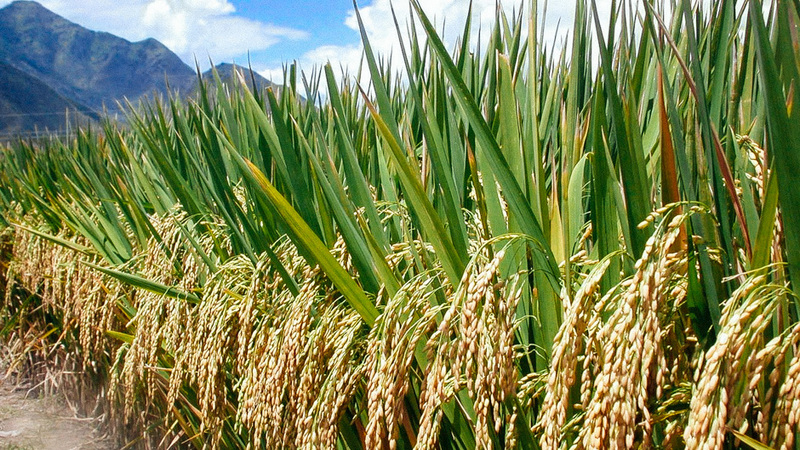 Already, approximately 4–5 million farmers around the world are using SRI methods with rice. The success of SRI methods can be attributed to many factors. Although they may appear risky, they actually reduce risk of crop losses; they don’t require farmers to have access to any unfamiliar technologies; they save money on multiple inputs, while giving higher yields that earn them more. Most important is that farmers can quickly see the benefits for themselves. Where this process will end, nobody knows. Almost invariably the use of SRI concepts and practices has resulted in greater yields, but some farmers’ results go beyond others’ to achieve super-yields for reasons that are not fully clear. Observations increasingly point to the contributions that plants’ microbiomes may be making, and they also suggest that this strategy for optimisation of growing environments is still at the beginning. The original (longer) version of this article was published in Independent Science News. For more information on the System of Rice Intensification please visit the SRI International Network and Resources Center (SRI-Rice). How Millions of Farmers Are Advancing Agriculture for Themselves by Jonathan Latham is licensed under a Creative Commons Attribution-NonCommercial-ShareAlike 3.0 Unported License. Based on a work at http://independentsciencenews.org/un-sustainable-farming/how-millions-of-farmers-are-advancing-agriculture-for-themselves/. Dr. Jonathan Latham is the Co-founder and Executive Director of the Bioscience Resource Project and Editor of Independent Science News. Dr. Latham holds a Masters degree in Crop Genetics and a PhD in Virology. He was subsequently a Postdoctoral Research Associate in the Department of Genetics, University of Wisconsin, Madison. Prior to heading the Bioscience Resource Project he published scientific papers in disciplines as diverse as plant ecology, plant virology and genetics. He regularly presents at scientific conferences on papers published by the Bioscience Resource Project. He is also a fellow of the 21st Century Trust. This sounds like a wonderful venture, but does it only work when the soil and environment are ‘perfect’? How well would this work if every farm, world wide, followed this method on their fields? Would it work for everyone? Does the soil remain ‘perfect’ after a few years of being worked in this manner? climate-smart, yield-increasing methodology that is being utilized by more than 10 million smallholder farmers in over 55 countries (see map). SRI-Rice is housed at International Programs of Cornell’s College of Agriculture and Life Sciences. scientific projects, such as a multi-country arsenic research study currently underway. “An informal international SRI network has been developing since 2000.